Today, the 9th Circuit issued an opinion in United States v. Juan Pineda-Moreno. The issue in the case, as framed by the Court, is whether law enforcement officers violate an individual’s 4th Amendment rights by entering upon the curtilage of the individual’s home and attaching a mobile tracking device to the individual’s car. For those readers unfamiliar with the term “curtilage,” it refers to the land and buildings immediately adjacent to the home and which has traditionally received varying degrees of protection under the 4th Amendment. Beginning in May 2007, Drug Enforcement Agency (DEA) agents observed the Defendant purchasing large quantities of a particular type of fertilizer at Home Depot. The type of fertilizer purchased by the Defendant is one associated with the growing of marijuana. Receiving information from another source, the agents concluded that Defendant and his associates were operating a marijuana grow operation out of a trailer that Defendant rented. Locating the trailer, the agents placed mobile tracking devices on Defendant’s automobile over a 4-month period. On occasion, the mobile tracking devices were placed on the auto when it was parked either on the public street or in a public parking lot. On at least two occasions, however, the agent affixed the device to the auto while it was parked in the curtilage of Defendant’s home, a few feet from the doorway. 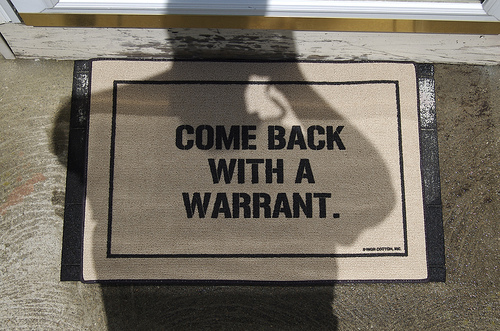 Defendant argued that the agent’s violated his 4th Amendment rights because they invaded an area of his property where he had a reasonable expectation of privacy. The 9th Circuit rejected this argument, construing the curtilage of the Defendant’s home as being only “semi-private.” Furthermore, the Court stated that, to demonstrate that the agents invaded an area that was protected by the 4th Amendment, the Defendant needed to produce evidence supporting a reasonable expectation of privacy. Among the types of evidence that might have swung the case in the other directions was “no trespassing signs,” enclosures, limited visibility from street, private nature of activities performed on the curtilage. I have placed a copy of the decision in the Box for those who are interested in reading the full text of the Court’s opinion and analysis. This entry was posted in 4th Amendment, civil rights, constitutional law, police misconduct and tagged 4th Amendment, 9th Circuit Court of Appeals, criminal law, criminal procedure. Bookmark the permalink.